As I was stopping in Paris for a few days I thought it would be a cool idea to try an hostel in the City of Light. Having slept in countless hostels abroad, I wanted to see what it was like for foreigners in France’s capital where I’ve lived a few years. Let me tell you I was pleasantly surprised. 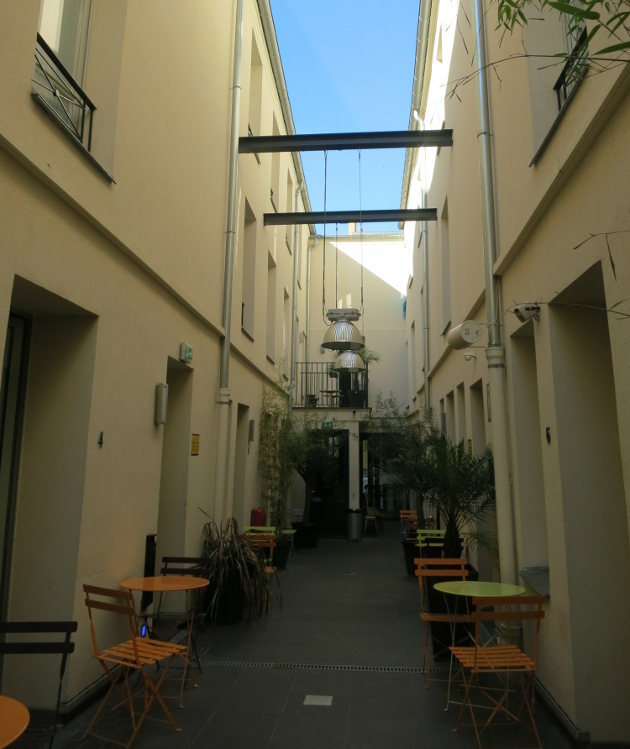 I stayed at The Loft, a “boutique hostel & hotel”, located near metro Belleville. As their description implies it’s not the cheapest hostel you can find in Paris. Knowing what accommodations are like in the city, I didn’t go with the cheapest option (I never do anyway). As a side note, there is a big hostel near metro Jaures which is cheaper and seems good. The Loft is recently renovated, has clean dorm rooms from 4 to 8 people with private bathrooms. The rooms are not very big and the bathroom is even smaller but this is Paris and I would have been surprised of the contrary. The central patio is really nice and foster a very good atmosphere in the evening. Close to line 2 and 9 of the metro, you can move around pretty easily. Although some foreigners may argue that this is far from the center or whatever, the fact that it’s a two minutes walk from the metro is a great selling point. Especially with the line 9 which takes you straight to Hôtel de Ville and line 2 to Etoile (Champs Elysées). The weather was great while I was there and as always when it’s sunny, cafés, bars and restaurants were packed. I love the unique atmosphere of Paris when everybody is out, it is something that you have to experience. On the other hand, I must admit that I was a bit shocked at how dirty Paris was in some places. It has been nine months since my last visit and I kind of forgot this aspect of the city. I got used to it again in 24h but expect to be surprised. Anyway, I’m happy to report that you can have a good time staying in a hostel in Paris!